Consuming Ocean Island tries to enlighten on how Banaba Island in the Pacific Ocean was heavily mined by countries such as Australia and the UK for phosphate which forced the original inhabitants out of their ancestral land. The mining on the island rendered the land uninhabitable; the locals were gradually relocated to Fiji. The narrative weaves together different images, records and memories from the displaced people to explain and give a clear understanding of the human and ecological calamity that took place. 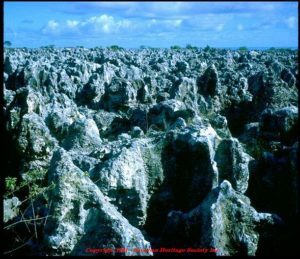 There are various studies that explain the origin of the rock forming the Banaba Island. Just like in the formation of other substances such as metals, the formation of the phosphate rock which forms the islands took a few centuries to take shape. However, it only took the discovery of phosphorus in the islands to destroy them and displace the natives. The mining left the land ugly through the craggy digging giving it a look of some primitive inferno. It only took a few years to totally destroy what nature had created in hundreds of thousands of years. The life in the islands had been consumed even before the locals knew anything about it. The islands was destroyed, the locals displaced as the natives became rich. The narrative of consuming the Ocean Island is one of cultural destruction showing the lasting impact of imperialism. The story of the Banabans teaches the world of what is often at stake when greed and industrializing and the indigenous minorities come into conflict. In most cases, the land is destroyed making it inhabitable by the people and thus living a lasting negative impact on the generations to come. Their experiences of the ocean islands give insight to world leaders on the plight of the people around the world who face similar situations.